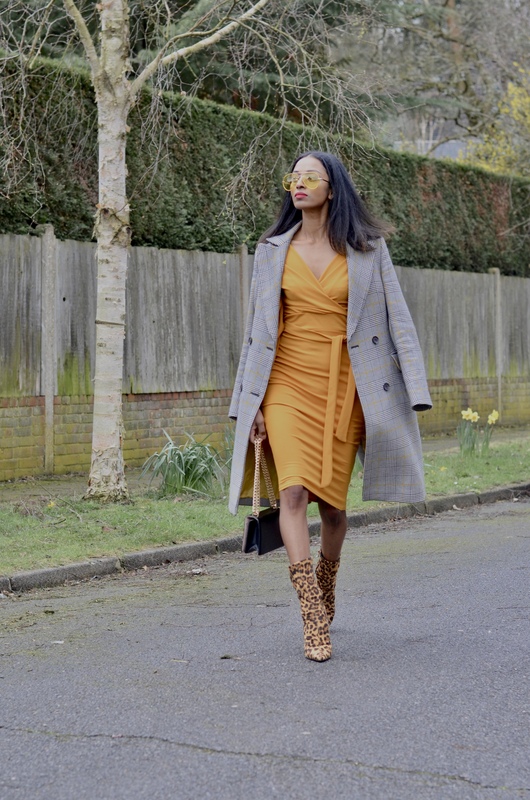 MUSTARD MIDI DRESS AND LEOPARD PRINT SOCK BOOTS - My name is Lovely! 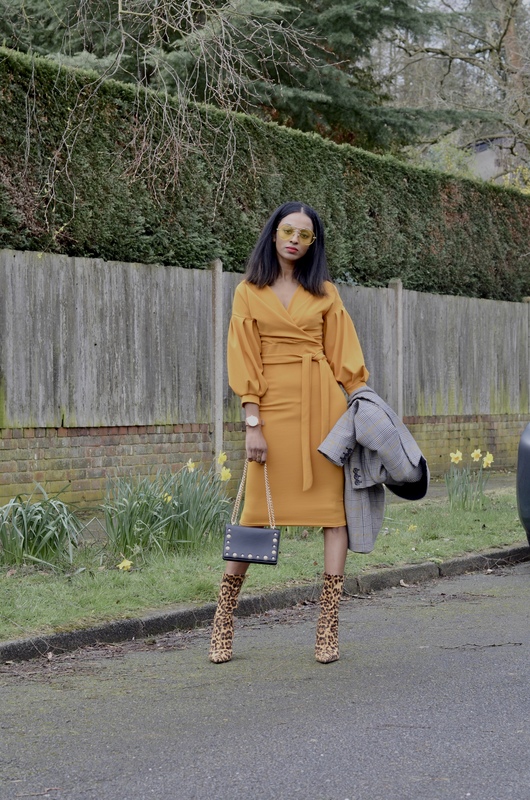 Good morning everyone, todays attire is based around this mustard midi dress. The yellow colour trend still continues and is one of the biggest trends for Spring. So for something to be a trend, usually at least three or four designers need to have it coming down the catwalk. 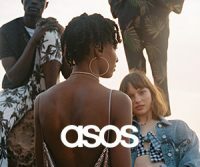 But there are those seasons when it feels like everyone is on the same page, this was the case during the 2019 New York Fashion Week. The colour yellow was popping up on the runways in different shades. The following designers incorporated this cheerful hue, from the likes of Monse, Adeam, Self-Portrait to Lela Rose. Lets begin with my dress, this mustard belted bodycon midi is from Femme Luxe Refinery. The perfect dress for a day to night look, with its bright colouring, figure hugging fit and wrap front design. 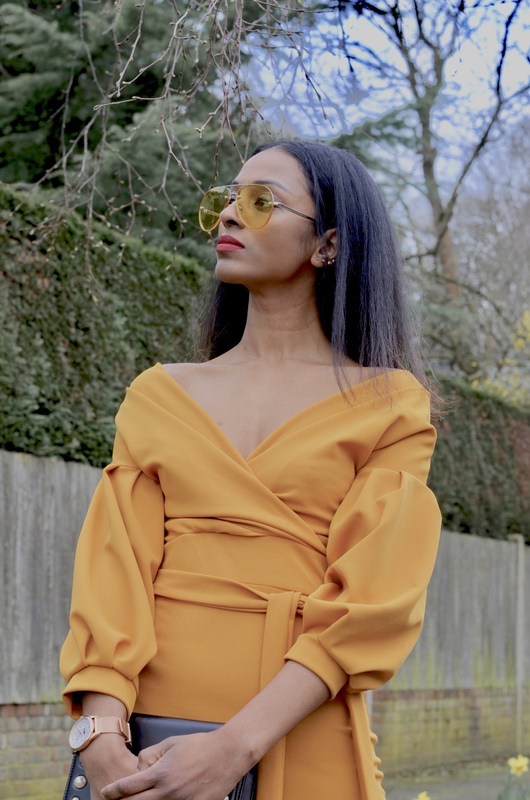 Along with the addition of the belt detailing and the elegant midi length, this affordable dress is a simple must have for my Spring/Summer wardrobe. A sophisticated midi dress which is sure to see me through this season with ease. Now when it came to stying this midi dress I opted to style it with my leopard print sock boots. These are from Public Desire and tie in beautifully with the mustard dress. A pair of boots that makes a big statement and gives my look that edge I am looking for. These are a close dupe for the Balenciaga knife boots. Adding the leopard print just gives the overall look some instant cool girl vibes. If you wanted to go for a non print pair of boots, then I would suggest opting for a neutral pair or even a check pair. This will tie in with the beautiful check on the coat and also give you that edge! Speaking of coats this one needs no introduction, it’s my gorgeous Karen Millen double-breasted Heritage Check number. 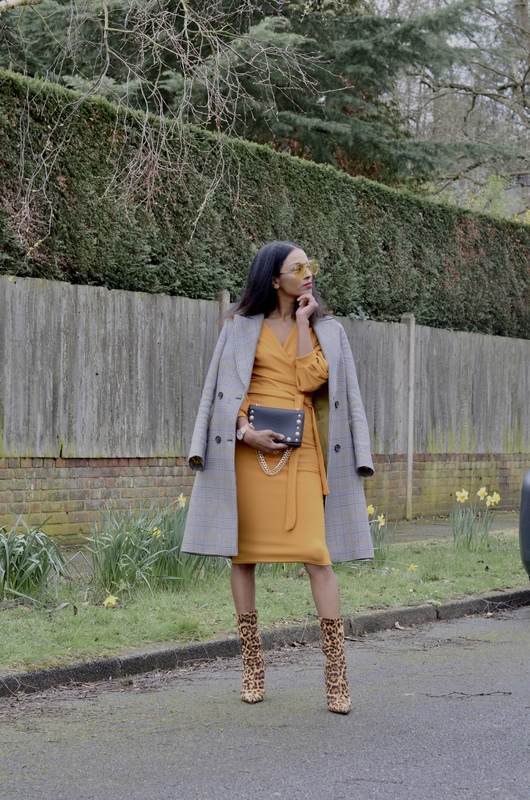 This coat has a yellow lining and yellow running through the coat, and therefore in my opinion works so well with my mustard midi dress. It’s a perfect check coat which is a must-have in my wardrobe. 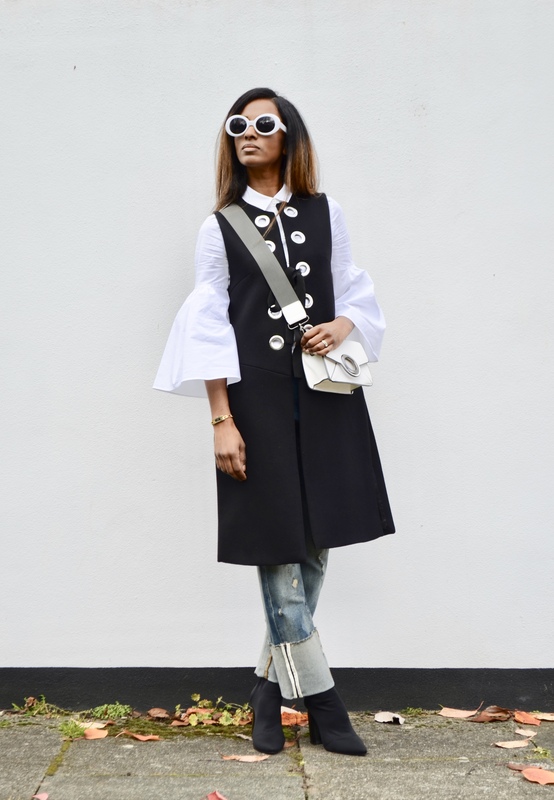 It is tailored to perfection in my opinion and sits so well on my shoulders and pulls the whole look together. Moving onto my bag and to this trusted black one from Marks and Spencer. Such an elegant bag, the pearl details at the front just amps it up and makes it look more expensive than it really is. I have had this bag for a few season now and still can’t get over how chic it looks. The bag is big enough to carry all my essentials and come with a gold chain. There are so many different ways I can wear it, either cross body, on my shoulder or as a clutch. Next and onto my accessories, first of my Filippo Loreti rose gold mesh watch in the style Venice Moonphase. The build and quality of the watch is flawless and the design is classy, I mean what’s not to like. On my lips I am wearing the shade Red Velvet from Lime Crime Velevtines. I adore how red and yellow work so well together and compliment each other. Finally finishing off my look I opted to wear my yellow tinted aviator sunglasses from Hashtag Sunglasses. So there you have it, all ready for a night out in my mustard midi dress. Thank you so much for stopping by to read my fashion blog. 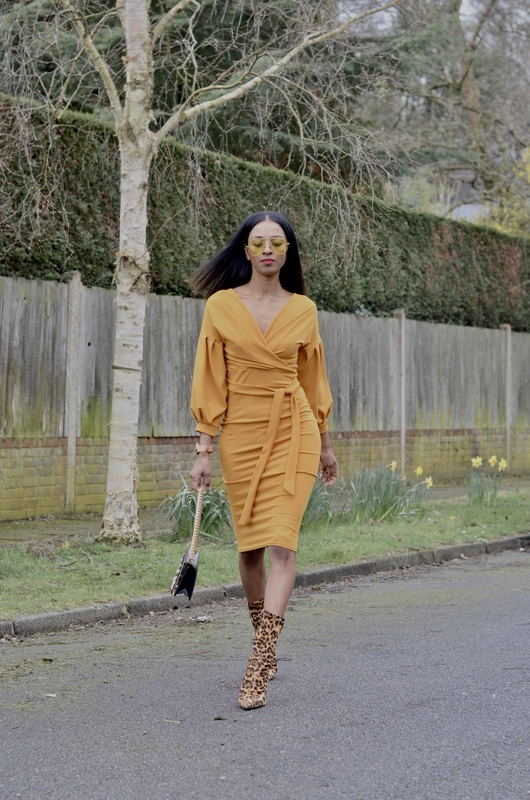 What do you think of this mustard midi dress? Are you someone who would wear the yellow hue? Please do let me know by leaving a comment below. This colored dress looks superb on you! And I love the fab booties. 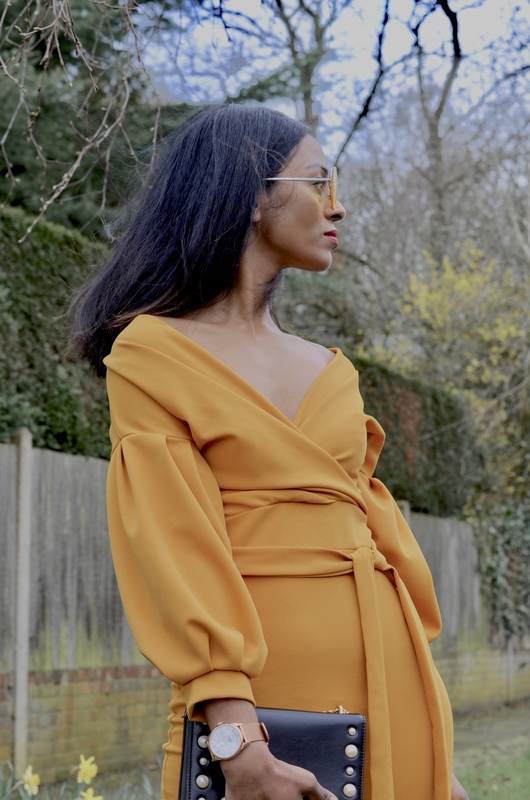 Mustard is such a fabulous colour on you Lovely! You’re rocking this bodycon dress, so beautiful. Thank you so much Simone. This dress is so lovely for spring ! I love the neckline and the sleeves ! Thank you darling, glad you like the booties! I love the mustard color. So beautiful. The boots are everything!! They go perfectly with the mustard dress! Love this post! This outfit is amazing! I’m totally loving mustard and I love how you paired the dress with those cute leopard sock booties. Always love your style!! I like this happy and warm colour coordinated outfit from your sunnies to the boots! I absolutely love this mustard dress. 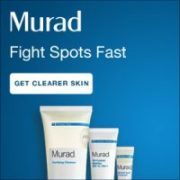 It looks amazing on you. 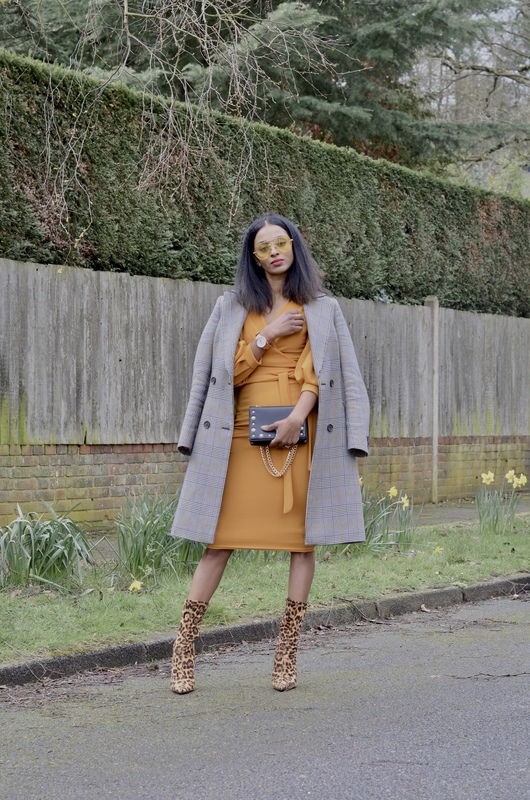 Pairing it with leopard booties was such a great idea, it makes the look more eye-cathing….and mustard matches leopard really well. 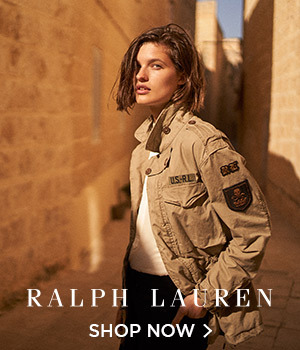 I also like the coat. You look like a super model Lovely! boots and sunnies are to die for!! thumbs up from me!! 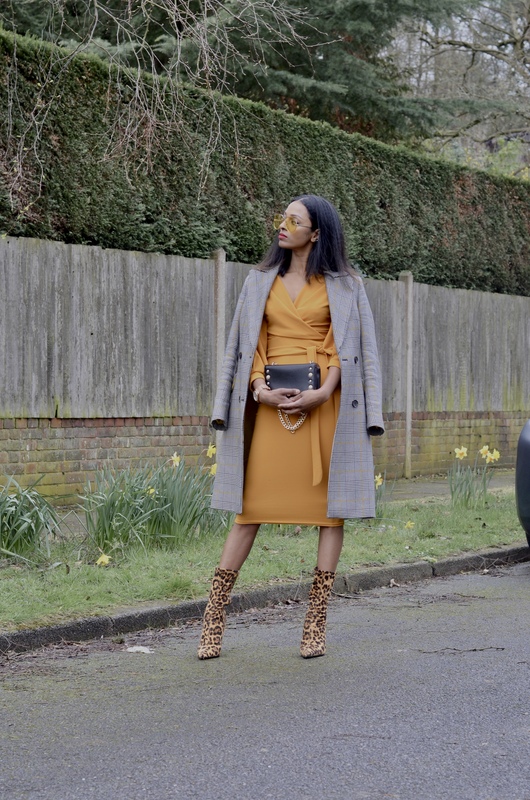 Love the mustard with the leopard boots. Fab look! That mustard dress is beautiful! I love the color so much and it goes perfectly with the leopard sock boots!